Earlier this year, a friend and CEO of a large software company in Minneapolis invited me to visit for a tour of the workplace. He was making active efforts to hire his workforce to be at least 50% women and was excited to introduce me to women in various positions in the tech field. I met executive level officers, product managers, HR directors, and program managers; but, no women in technical positions. Admittedly, I was disappointed by this. While women may be involved in tech, female software engineers are still anomalous, even when active efforts to hire women in the field are being made. Women and/or femininity are often associated with soft skills like emotional or social intelligence. I, myself, do find this to be true. This skill set is especially pronounced in the presence of underdeveloped social skills, which, somewhat true to stereotype, CS folks notoriously have. For women, this implicates that they are perceived to be better in managerial positions rather than technical positions. As a person who is socially inclined, energetic, and having specific hard skills, I find this dichotomous thinking problematic. Perhaps this is why women, even in the tech field, tend to hold managerial positions instead of technical positions. Also, if an individual, most usually a woman, has developed soft skills, they also tend to be regarded as lacking in hard skills. In all honesty, I’m quite tired of talking about this pervasive yet complicated issue. But I’m even more exhausted of being an outlier in a field often dominated by men. I was concerned that my summer of interning would be stifled by this dichotomous thinking. Coming up on a month at Tome, I'm happy to report I've been tasked with an exclusively technical and largely individual project. I've been working on a mapping application that dynamically queries open street maps for road geometry data and determines and assigns perceived stress levels to a route, then finds the lowest stress route between two points for cyclists. Being an avid cyclist and glutton for algorithm analysis and design, I am genuinely excited and engaged with the work I'm doing. Coming in to my first work experience at a software company, I had concerns and reservations. I had anticipated my experience as a woman in a software-engineering work environment would be disproportionately sexist and that I would not be able to partake on rivetingly challenging projects. Tome has been a pleasant work environment in that and all other regards. However, I still feel a level of disconnect that I feel in almost all other technical spaces. In addition to being socially apt and a woman, which might lead others to categorize me at one pole of the hard versus soft skill spectrum, I have a lot of tattoos, would describe my style as “caustic femme." The most common affirmation of the incongruence between my personality or appearance and the field I work in is that, throughout my career, peers and professors alike have disregarded my presence, avoided eye contact, or have had difficulty in addressing me directly. The response to my listing my experience is typically that "[they] just have never seen anyone like [me] in a computer science or tech context before." I've never seen anyone alternate bites of cheeseburger and oatmeal without taking a breath, as does my hilarious office-mate, but I still acknowledge his ability to do so not as a remarkable feat, but as part of the way he is. But I get it, there's a comfort in categorizing people based on the molds one already has in their mind. I often find myself straddling these labels and am excited by the plethora of others doing the same. Once in the Wall St. subway station, I saw a business-woman in a tailored suit with briefcase in hand and a glinting ring strung through her septum making herself vomit into a trash can at 2pm on a Tuesday. I'd bet she brought some valuable and diverse opinions to whatever office she worked in! It's unfortunately hard in our society to recognize that a person can be both conventionally beautiful and highly intelligent, both a programmer and a genuine person, or that one can not be a straight, white man and yet also be incredibly capable of mastering algorithm analysis while being a selfie queen. If there’s anything to bear in mind as you approach the world and perceive others, it’s to remember that you can do both. You can do things that are seemingly at odds with your identity and have a multiplicity of valuable skills that are essential to who you are. Someday, I hope that this incongruence will be celebrated for adding dimension and diversity to the workplace...but until then let's shotgun some Tecates and talk about non-deterministic polynomial-time hardness! 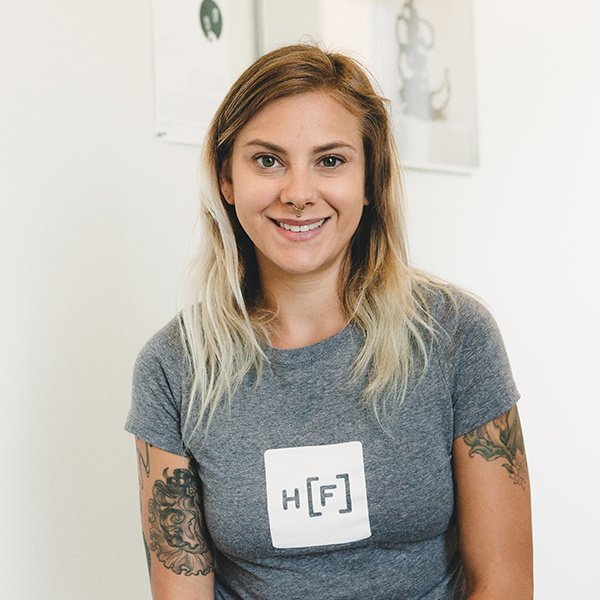 Samantha Felzien, 2018 Hacker Fellows Intern, is finishing up her Computer Science degree at the University of Arizona. She is working with Tome for Summer 2018.